"Historian James Hansen…expertly combines the saga of Armstrong with the historical background of America's introduction to the Age of Space. An excellent book." 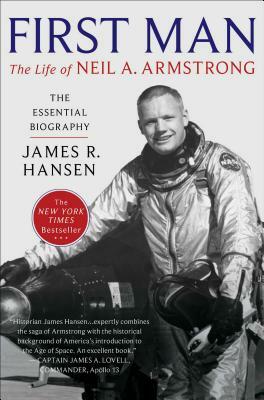 "Jim Hansen has captured the essence of Neil Armstrong, not only as the first man on the Moon, but also as an outstanding aviator and astronaut. I was there for Neil¿s other major ¿space step¿ ¿ he recovered Gemini 8 from the ultimate end game with aggressive action, cool skill and creative judgment seldom performed in any aviation or space endeavor. Just 16 days after the deaths of the Gemini 9 crew, he probably saved the Moon. Jim Hansen has written an exceptional and accurate account of a unique period in aerospace history and the adventures of Neil Armstrong." "A fine authorized biography brimming with groundbreaking research, fresh anecdotes and fair-minded analysis. . . . Hansen should be commended for decoding the enigmatic Armstrong: a space hero short on words but sky-high on Midwestern integrity." "For Americans who lived through it all, and for those who came later and can't imagine such an achievement, First Man is compelling reading." "A powerful, unrelenting biography of a man who stands as a living testimony to everyday grit and determination. . . . A magnificent panorama of the second half of the American twentieth century. . . . A must for astronaut buffs and history readers alike." "A lot of us have been waiting a long time for a book like this one, and it was well worth the wait. . . . Will likely stand as the definitive biography of Neil Armstrong." "Masterfully written . . . technically accurate, scholarly yet independent and accessible. . . . Mission accomplished and a perfect touchdown." "First Man burrows deep into Armstrong's past and present. . . . What emerges is an earnest and brave man." "To understand Armstrong on his own terms is to see a large truth of our time. . . .A compelling and nuanced portrait." "Armstrong raises the mirrored visor for the first time." "Hansen capably captures both Armstrong's expertise and his Garbo-like demurral of fame." "Thoroughly researched... incredibly detailed . . . Hansen's attention to detail serves the story well, relaying the difficulty and danger inherent in the Apollo program. Along with this comes an understanding of Neil Armstrong himself." "[A] taut, well-told tale of our nation's race to the moon and the man who took the first step." "More than the most complete story of Armstrong's remarkable life, [First Man] is a fascinating study of how the modern world treats a historical figure . . . Hansen does a fine job of retelling Armstrong's childhood and remarkable career in aviation. The NASA years have been covered in many other books, but Hansen manages to keep them fresh, benefiting from Armstrong's perspective . . . As Hansen shows, the way Armstrong chooses to carry the heavy burden of history only proves once again that he has the right stuff."